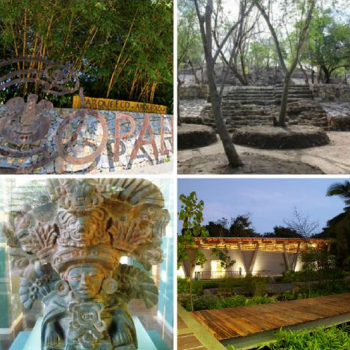 The Eco-Archeological Park of Copalita opened in 2010 at a development cost of over 80 million pesos ($5.5 million USD). This relatively new excavation has only unearthed 30%-40% of the buried structures, but what is visible is distinctly different from other archeological sites seen around Mexico. Rather than building with carved stone, these ancient people employed round river rock. In spite of being a relatively small site, it is a significant discovery because its origins predate Monte Alban by about 400 years. Monte Alban was inhabited for nearly 1500 years beginning around 500BC. Evidence suggests that the site at Copalita was occupied at various times between 900BC through 1000AD.